Most industries have rating systems that give customers quick snapshots of companies’ product and service quality and evaluations on different parameters, such as safety, responsiveness, and pricing. 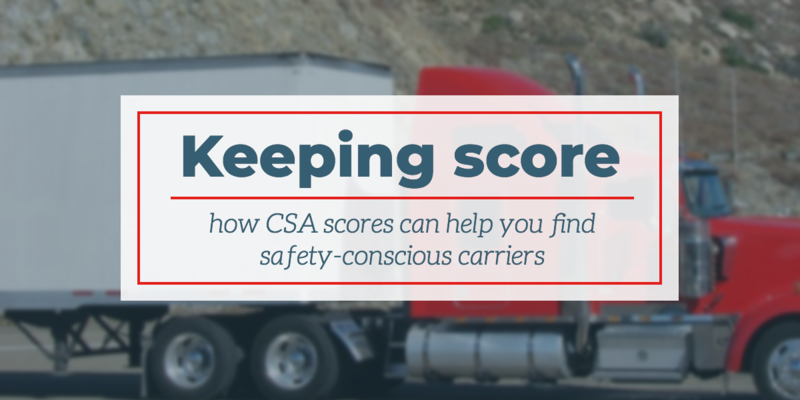 For carriers transporting goods on U.S. highways, one of the best-known is the CSA score, which holds motor carriers and drivers accountable for their role in road safety performance. It’s part of the safety compliance and enforcement program managed by the Federal Motor Carrier Safety Administration (FMCSA). CSA scores are the primary way that the FMCSA identifies high-risk motor carriers and drivers, so they can intervene with carriers that pose safety risks. CSA identifies carriers with safety problems and prioritizes them for interventions, such as warning letters or safety investigations. Scores are compiled by gathering data from several sources, including roadside inspections, driver and vehicle violations, crash reports from the last two years, investigation results, and registration details. The collected data is organized into seven Behavior Analysis and Safety Improvement Categories (BASIC) by the FMCSA’s Safety Measurement System (SMS). Each category includes a variety of potential violations, with each violation adding points to the score. Violations increase CSA scores anywhere from one to ten points based on severity. Unsafe driving: dangerous or careless operation of a vehicle, including unsafe driving practices like speeding, improper lane changes, and failure to wear a seat belt. Crash indicator: a high volume of state-reported crashes. Hours of Service (HOS) compliance: incidents of vehicle operation by drivers who are ill, fatigued, or non-compliant. Vehicle maintenance: mechanical defects and failure to make required repairs. Having the correct tools and equipment to secure a load is included in vehicle maintenance. Controlled substance and alcohol: impaired driving of any kind: alcohol, illegal drugs, misuse over the counter and prescription drugs. Hazardous materials compliance: unsafe or incorrect handling of hazardous materials, including leaking containers, improper placarding, and missing shipping papers. Driver fitness: vehicles operated by drivers who are unfit due to lack of training, experience, or medical conditions. The system groups together carriers that share a similar number of safety events (e.g., crashes, inspections, or violations), then ranks them according to severity, assigning a percentile from 0 to 100 to prioritize them for interventions. The lower the percentile, the better the performance. For carriers, the measurement system uses the previous 24 months’ data. After two years, violations are removed from carriers’ records. For drivers, the timeframe is the last 36 months of data. CSA scores for trucking companies are updated monthly to give everyone access to the most recent scores. Carriers’ and drivers’ CSA scores are available on the FMCSA’s Safety Management System (SMS) website for both trucking companies and the public. CSA scores can be viewed for any motor carrier with an active USDOT number at the FMCSA’s website at csa.fmcsa.dot.gov. Click on “Company Snapshot,” and search for a carrier by USDOT number, MC number, or carrier name. While accessing carriers’ scores is relatively easy, it may be just another burdensome “to-do” on your already long task list. Reaching out to an experienced third-party logistics partner to help with the entire carrier assessment process, including accessing safety scores, can save you valuable time and trouble, while ensuring you hire the right carriers to meet your budget, shipping requirements, and safety expectations. Backed by a 3PL with expertise and experience in your industry, you’ll be assured of an optimized carrier selection process — and that your goods have the highest potential of arriving at their destination safely and securely.